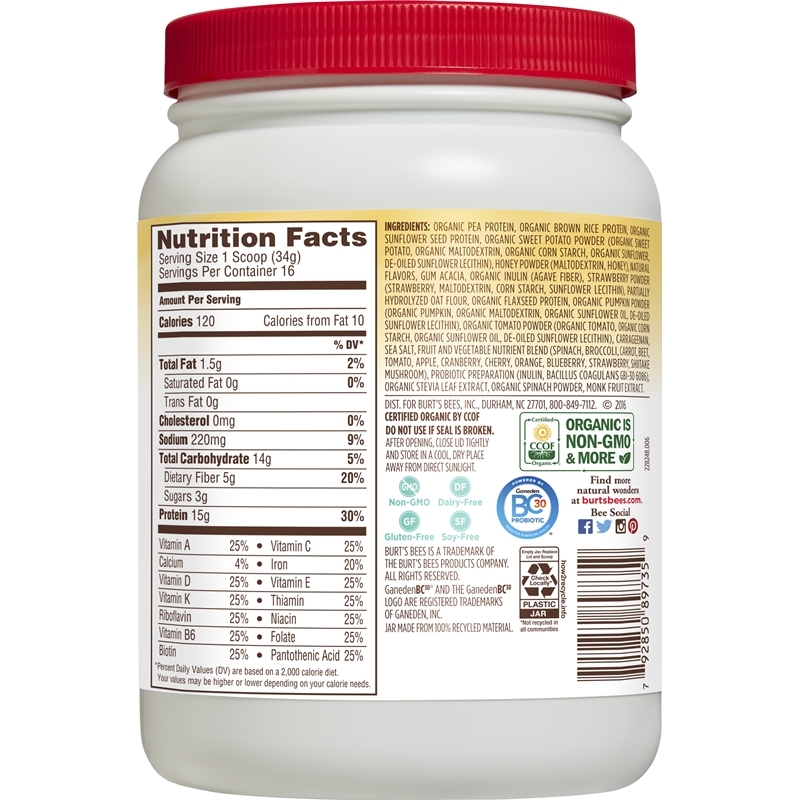 Vanilla o Protein + Gut Health is rated 4.5 out of 5 by 13. Get more of the good stuff. 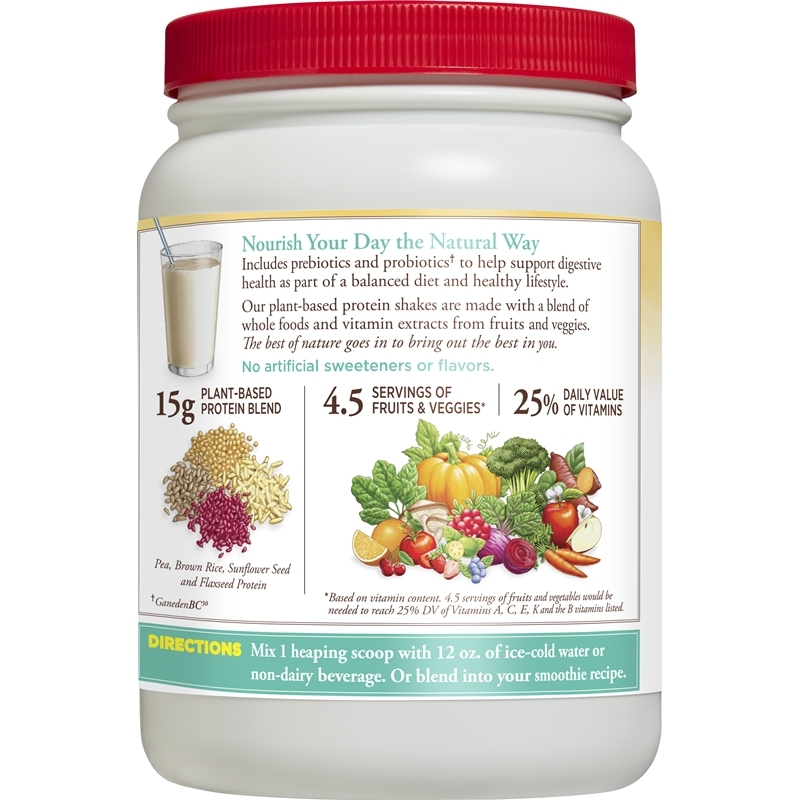 Probiotics are live bacteria that help support digestive health—often called “good” bacteria. 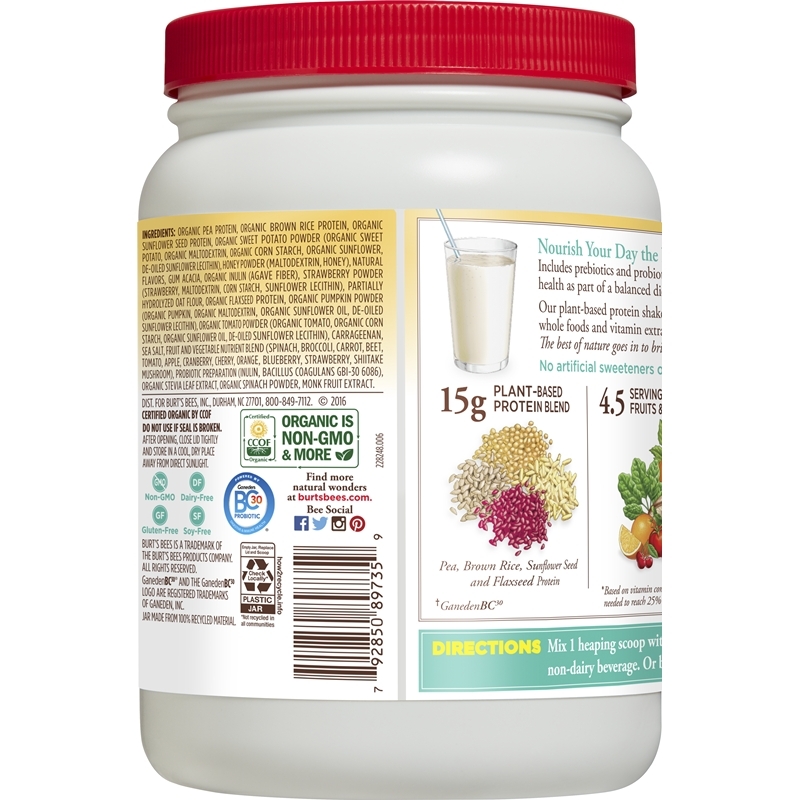 Burt’s Bees™ + Gut Health with Probiotics contains 15 grams of plant-based protein, real fruits and vegetables, prebiotics and GanedenBC30® probiotics to help encourage the healthy bacteria in your gut. *Based on vitamin content. 4.5 servings of fruits and vegetables would be needed to reach 25% DV of Vitamins A, C, E, K and the B-vitamins listed. *** Vitamins A, C, D, E, K, Thiamin, Riboflavin, Niacin, B6, Folate, Biotin and Pantothenic acid. 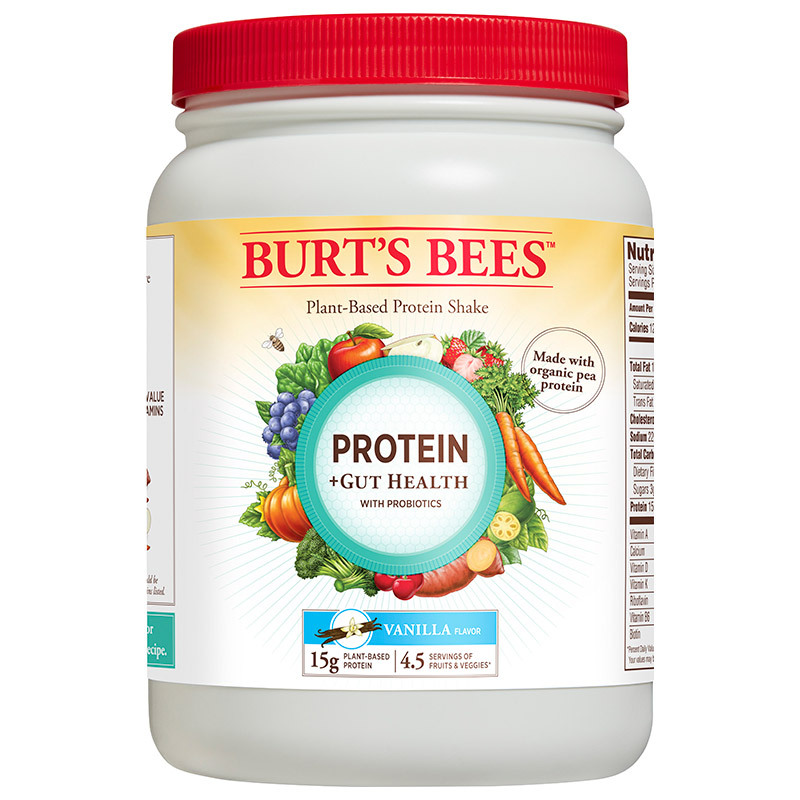 BURT’S BEES™ PROTEIN +GUT HEALTH VANILLA SHAKE INGREDIENTS: ORGANIC PEA PROTEIN, ORGANIC BROWN RICE PROTEIN, ORGANIC SUNFLOWER SEED PROTEIN, ORGANIC SWEET POTATO POWDER (ORGANIC SWEET POTATO, ORGANIC MALTODEXTRIN, ORGANIC CORN STARCH, ORGANIC SUNFLOWER, DE-OILED SUNFLOWER LECITHIN), HONEY POWDER (MALTODEXTRIN, HONEY), NATURAL FLAVORS, GUM ACACIA, ORGANIC INULIN (AGAVE FIBER), STRAWBERRY POWDER (STRAWBERRY, MALTODEXTRIN, CORN STARCH, SUNFLOWER LECITHIN), PARTIALLY HYDROLYZED OAT FLOUR, ORGANIC FLAXSEED PROTEIN, ORGANIC PUMPKIN POWDER (ORGANIC PUMPKIN, ORGANIC MALTODEXTRIN, ORGANIC SUNFLOWER OIL, DE-OILED SUNFLOWER LECITHIN), ORGANIC TOMATO POWDER (ORGANIC TOMATO, ORGANIC CORN STARCH, ORGANIC SUNFLOWER OIL, DE-OILED SUNFLOWER LECITHIN), CARRAGEENAN, SEA SALT, FRUIT AND VEGETABLE NUTRIENT BLEND(SPINACH, BROCCOLI, CARROT, BEET, TOMATO, APPLE, CRANBERRY, CHERRY, ORANGE, BLUEBERRY, STRAWBERRY, SHIITAKE MUSHROOM), PROBIOTIC PREPARATION (INULIN, BACILLUS COAGULANS GBI-30 6086), ORGANIC STEVIA LEAF EXTRACT, ORGANIC SPINACH POWDER, MONK FRUIT EXTRACT. -Daily values are based on a 2,000 calorie diet. -Vitamins A, C, D, E, K, Thiamin, Riboflavin, Niacin, B6, Folate, Biotin and Pantothenic acid. 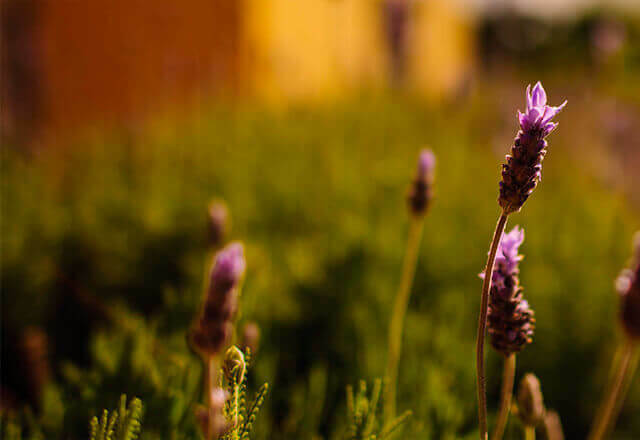 Product formulations, packaging and promotions may change. For the most current information, refer to product packaging. To Use: Directions: Mix 1 heaping scoop with 12 fl oz. of ice-cold water or non-dairy beverage. Or blend into your smoothie recipe.